The rich cultural heritage of Nepal has evolved over centuries. Cultural research multi-dimensional cultural legacy encompasses within itself the cultural diversities of different ethnic, tribal, and social groups inhabiting different altitudes, and it manifests in various forms: music and dance; art and craft; folklores and folktales; languages and literature; philosophy and religion; festivals and celebrations; and foods and drinks. The ancient and refined traditional culture of Kathmandu, so the whole of Nepal, is a continual and exceptional meeting of the Hindu and Buddhist ethos practiced by its highly religious people. The arts are made of wood, stone, metal and terracotta, and found in profusion in various temples, shrines, stupas, gompas, cheetahs and palaces. Kathmandu is home to a number of museums and art galleries, including the National Museum of Nepal and the Natural History Museum of Nepal. Nepal’s art and architecture are a dazzling display from medieval to the present, which is a heady amalgamation of two of the ancient and greatest religions of the world – Hinduism and Buddhism. The cultural diversity of Nepal has facilitated the growth of a number of cuisines based on the ethnic groups and the geographical features of the nation. Popularly served though, is Dal Bhat, which is a dish of lentils and rice, generally served with vegetable curries and forms a staple part of the diet. Most of the fairs and festivals that are observed in Kathmandu have their origin to the Malla period. This was further given an urban cultural touch, not limiting it to the Newari festivities. Nepal has many cultural places for research to explore for short to long holiday like Gale Gau, Barpak, Raute Gau, Khumjung and Khunde, Junbesi, Dolpa, Mustang. 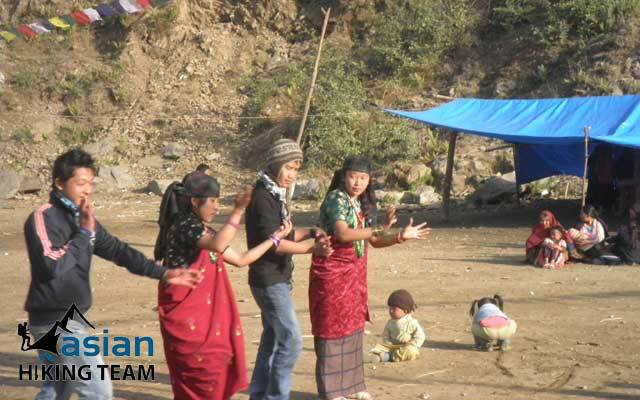 However, our itinerary brings you the one of an ethic group “Gurung village” in the western part of Nepal. The village call Sikles (Siklis) is a beautiful and traditional Gurung village hanging on a hill at an altitude of 2000 m. It is the second largest Gurung village in Nepal. The village once was famous as ‘SAT SAYA SIKLES’ meaning the village of seven hundred households. Sickles lie above Madi Khola, overlooking Annapurna IV to the north and Annapurna II and Lamjung Himal to the east. Narrow village lanes with stone and mud houses grouped in ribbons, Sikles is famous as a well maintained traditional Gurung cultural village. The village includes five traditional neighborhoods: Lama-Thar, Sabha-Thor, Harpu- Thor, Dhaprang-Thor and Gairi-tar. Each holds a special significance to the community as a whole. If giver itinerary is not matched as your interest or your own choice to explore the culture and custom let us know. Tour duration: 12 nights 13 days. Activities: Gurung Culture, Cultural and Historical city sightseeing, Hinduism, Buddhism, Tourist paradise city pokhara visit, her people, her culture, her custom. Day 01: Arrive in Kathmandu, transfer to Hotel in kathmandu, Overnight. Day 02: Sightseeing in Kathmandu full day, Overnight Kathmandu. Day 03: Sightseeing in Patan and Bhaktapur, Overnight in Kathmandu. Day 04: Kathmandu to Pokhara by tourist bus 6 hours or by plan 25 minutes. Day 05: Drive to trail head Hemja (Milanchowk) – Kharpani (hot spring) 3/4 hours O/N Local house. Day 06: Kharpani – Ghalekharka (2100m) 5/ 6 hours walking, overnight home stay. Day 07: Ghalekharka (2100m) – Nyauli Kharka (2713m) 4/5 hours over night home stay. Day 08: Nyauli Kharka- Sikles village (2000m), 4/5 hours, overnight home stay. Day 09 and day 10: Sikles research days. Day 11: Sikles to Pokhara 4/5 hours driving by Jeep, overnight in Hotel Pokhara. Day 12: Pokhara to Kathmandu by bus 6 hours or plan 25 minutes, overnight in Hotel. Day 13: Departure from Kathmandu or next trip.